The Christmas toynadoes weren’t even unwrapped yet, but they were all staring me down every day as they laid under the tree. It was the season of giving and joy, yet I felt completely stressed out and frazzled and completely run over by the toys under the tree that hadn’t even made it into the regular mix of toys strewn throughout the house yet. I felt like the only mom who was feeling both like she hadn’t purchased enough for her kids’ Christmas, yet also completely overwhelmed by the amount of things they already had. I went to work all day, then came home and attempted to prepare our home and the kids’ bedrooms and their playroom for the huge influx of toys that were about to roll in. Toys from us, toys from family and friends and of course toys from Santa. The season was in full effect. Everyone was joyful and shopping and spending and filling their homes with more toys, and sharing the great finds and stacks and stacks of toys they were about to give their kids. And I felt like the biggest scrooge on the planet. And also the biggest failure of a mom because I couldn’t afford more for them. When I thought about Christmas morning I was excited for their excited faces, but I knew the excitement would go away as quickly as it came and the most excitement and joy they would experience from those toys would be in the moment they were unwrapped. The shelf life of the new toy joy on Christmas back in those days was about five seconds. I thought Christmas was supposed to be the most wonderful time of the year. Especially as a mom. I thought it was supposed to be squeals of joy, happiness, gratitude, love, appreciation and giving. I thought it was supposed to mean presence and time with my loved ones enjoying an out of the box day where we got new things and played together. Instead I was feeling resentful, buyer’s remorse, even shame and dread over Christmas morning. Because… yay for more clean up and yay for MORE mess. I mean Christmas back then was just our normal clutter on crack and the mess I ignored until the day after but by then the novelty of the new toys had worn off and the kids were back to playing with their usual favorites. Why did I even buy all this stuff from Santa anyway? It’s not that I don’t want to give my kids toys, or that I want to ignore the Christmas season in holiday. I just knew deep down that something had to give and I wasn’t doing Christmas right and the perfectionist in me stopped me from even trying to do anything different in years to come for fear of scarring my kids for life or ruining Christmas for them. I just felt like Christmas morning was so empty, despite wanting it to be joy-filled and magical. I could not see past the piles of toys that were getting added to the existing pile of toys. I watched my friends and family to see how they did Christmas. Some said they did the four gift rule – the whole something they need, something to wear type thing. That just seemed too restrictive and boring to me. If I am getting my kids gifts I want them to be exciting and special and make them squeal out of excitement. I had heard of friends giving the gift of “experiences” but I didn’t even know what that meant really. Plus I knew my kids who were only able to think and process in the present with immediate gratification wouldn’t appreciate a zoo pass they could cash in on when the weather warmed up. I knew the way we were living wasn’t sustainable, but I just didn’t know what to do about it. Fast forward to when we were living in Florida for our first Christmas after ditching all of our clutter and had NO family or friends within 4,500 miles. We also had no money until AFTER Christmas and were unable to purchase gifts for our kids until the day after. They were two and four at the time and their concept of times wasn’t there so it worked out well for us. It was hard on my mama heart at first though. Never had I not been able to afford anything for Christmas. We didn’t even buy a tree, we just used the little run down fake one our landlords had stored in the garage. I wasn’t going to let it get me down though, and to be quite frank – I was purely enjoying living without the mountains of toys we had ditched when we had moved Alaska to Florida with only three suitcases total. I was quietly excited to not have the mountains of toys on toys on toys, and I felt a sense of peace and joy that had never penetrated my mama soul during my first years of motherhood, especially during Christmas. I had always associated the holidays with pressure and an usnpoken rule to “keep up”. My guilt was coming from a place of comparison and Toys R Us gift guides (too soon?). I was yearning to keep up with the moms who had toy stashes and wrapping papers and bows galore. I decided I was done with that crap thinking. What I did next sealed the deal on changing the fate of my motherhood and every Christmas to come. I decided to submit to the peace, ease and relief I was feeling by ditching all of our clutter months before to move across the country. My husband and I made a spur of the moment decision to move from our one and only home in Alaska to Florida in a matter of five weeks. We didn’t have the means to bring all of our stuff with us, so I stayed back and purged it all marathon style. Living in Florida without all the clutter changed everything in my motherhood. It felt like the benefits of decluttering happened overnight, because from the moment I arrive in Florida without a cluttered home my to do list that never ends, my messes I was a slave to in the form of laundry, dishes and toys, and the general burden of my clutter was instantly gone. Never to return. I was free. All of a sudden I was able to play with my kids without falling behind on everything. I was no longer able to hide behind “busy”, “too tired” or “too much to do” and after bed time had nothing but a clean home and time to spend pouring into my marriage. I was able to discover who I was as a mother, woman, wife and friend. Why was I going to let all that come undone by buying a glorified assembly line of toys to open on Christmas morning? You know what I’m talking about.. stacks and stacks, unwrap, take a pic, NEXT! Then they sit there ignored and left to die in the toy graveyard that is the playroom, or under the bed. Or until you’re so fed up with the constant pick up you throw them away in a momtrum (mom tantrum) and in disbelief by how ungrateful your kids are by the mountains of toys you and others bought. Even though science tells us that too much stuff is overwhelming and not fun for kids. Why was I feeling GUILTY about wanting to keep my motherhood simplified, joyful and present? Why was I so worried about what other people might think if I didn’t post a Christmas tree loaded with gifts from Santa on Christmas Eve? Why did I have this deeply rooted belief that a good Christmas had to be me, my kids and piles of things to unwrap? I vowed to never get to that place of overwhelm, burden, resentment and stress over Christmas again. I vowed to make that Christmas we couldn’t afford toys for our kids the best one yet and do you know what we did? We went to the beach and made it a new tradition. I remember looking around at the beach feeling abundantly blessed beyond belief and feeling such a deep satisfaction for finding pure joy in a season that could have totally destroyed me. And for what? Some toys on sale that my kids wouldn’t even remember? Now in the Christmases to come I want you to know, we do buy our children gifts. We do enjoy the act of giving, and I personally love seeing their faces light up in excitement because we found them the perfect gift for them to enjoy. I love spending our Christmas days enjoying the gifts and using them, and using them all year round. I love the appreciation and gratitude my children express when they are given gifts. 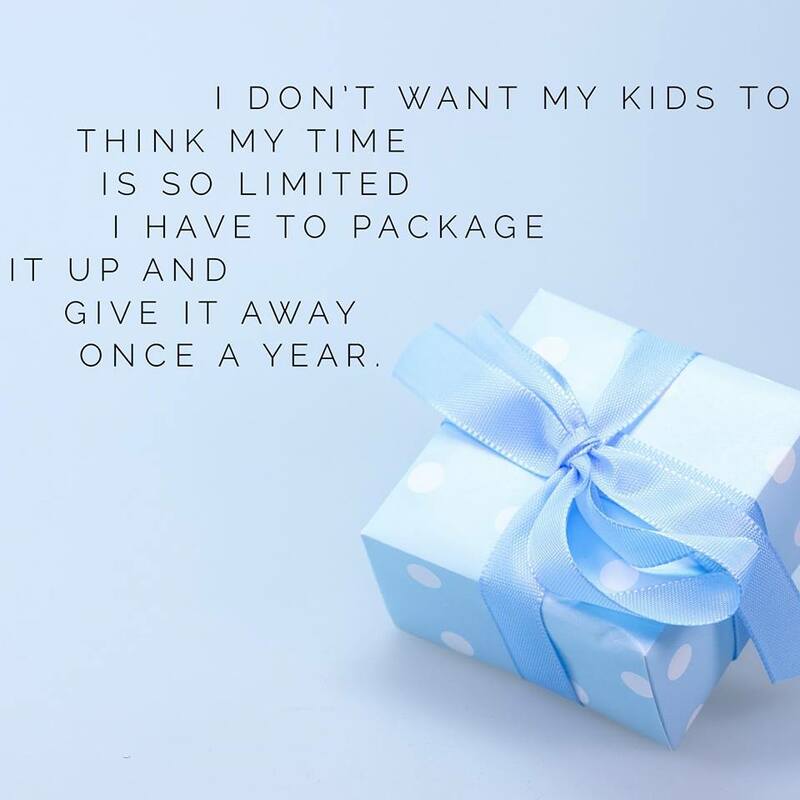 I even love when my family and friends “go overboard” with the gift giving for my children and that it is no longer a burden for me and that I don’t see this act of love as just more work for me to clean up. No matter what your personal beliefs are, Christmas is a time of giving and receiving. I want to help you enjoy this Christmas season with a grateful heart. I want you to feel so much joy and peace in your heart that it overflows into everyone and everything around you. 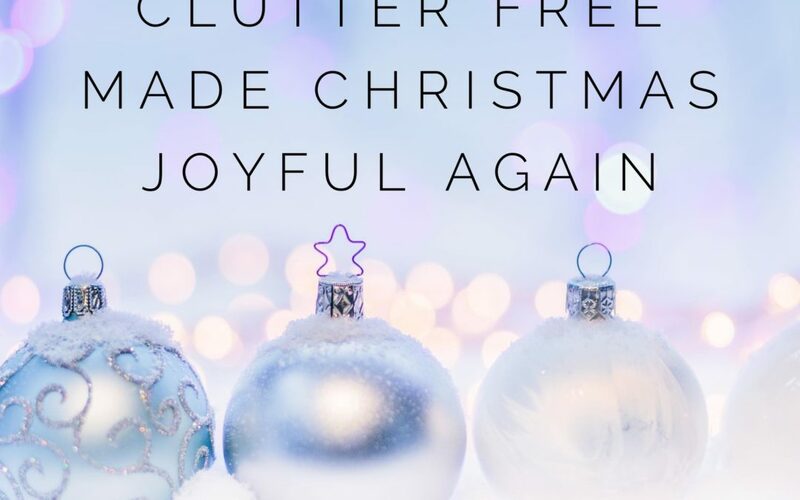 I want to help you un-scrooge your Christmas this year and if you’re ready I create this free challenge to help you get started decluttering – Try On Minimalism. This isn’t about finding a nice way to tell your family and friends that you are only wanting to accept gifts in the form of experiences this year. I won’t be teaching you how to put a band-aid on such a huge open wound like that. I want to help you get to the root of the issue for you and that is how you are living the other 11 months of the year. Being unable to pay to ship all of our worldly possessions across the continent was the best gift for my motherhood and family because it gave me everything I wanted in motherhood – time, energy, presence and love. I want to give you this too, my sweet friend. This Christmas the best most authentic gift you can give your family and children is the gift of a home that feels like a have. The gift of a mom who is able to play with them. A mother who gives her time freely without conditions all year round, not just in the form of a coupon book for time with you on Christmas that is forgotten about by January. You deserve this. This challenge is free and I hope that you take me up on it and trust me when I say – this season is about joy, peace, presence with family and love, and you are not excluded from that. 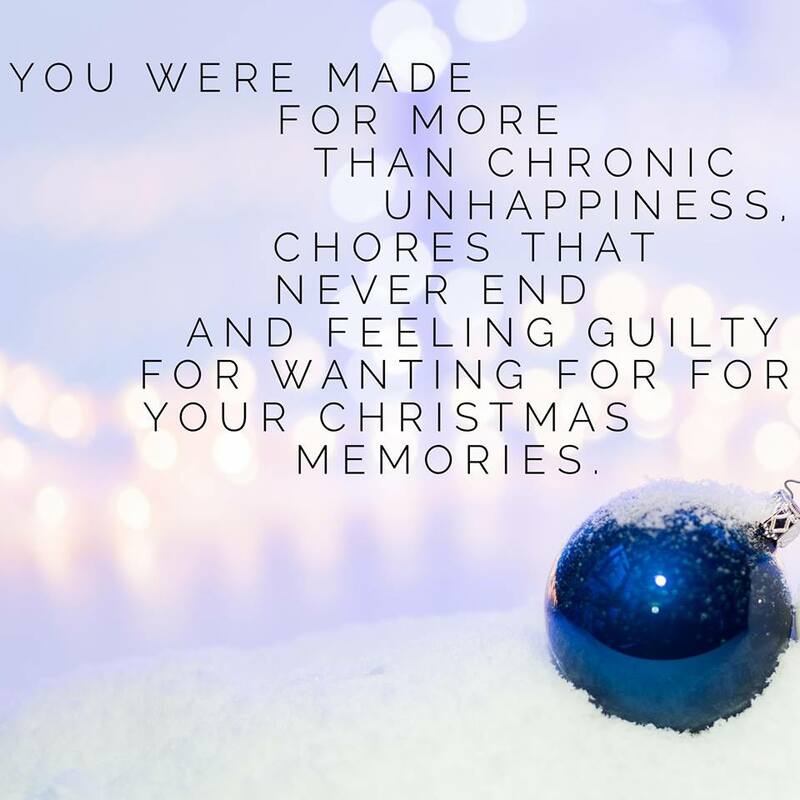 You were made for more than chronic unhappiness, chores that never end and feeling guilty for wanting more for your Christmas memories with your family by choosing to live with less stuff.